Jubilation. From Julien Leparoux. Wow! 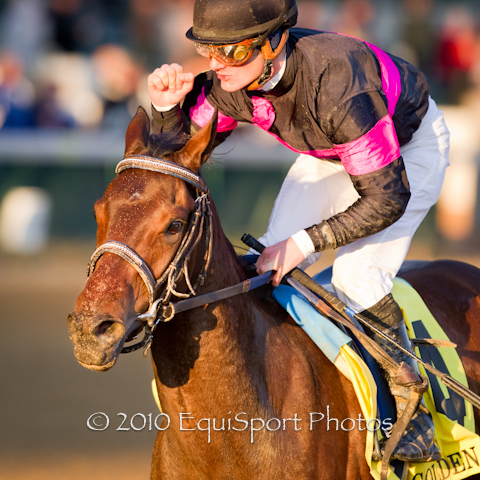 The usually reserved jockey flashed a celebratory fist pump while coasting to an easy win in the Grade 2 Golden Rod aboard KATHMANBLU at Churchill Downs November 27th. One could not help but think that the filly had just stamped her ticket for the 2011 Oaks. And Julien knew it. Trainer Ken McPeek got in on the excitement about Kathmanblu as well, “She is now a big time Oaks prospect. She’s not a big filly; she is a little compact filly, and as the months go on she has gotten better and better. I’ll think she will keep going as a 3-year-old." AWESOME FEATHER should be on everyone's list of top Oaks prospects after a nice win the the Breeder's Cup Juvenile Fillies November 5th at Churchill Downs. 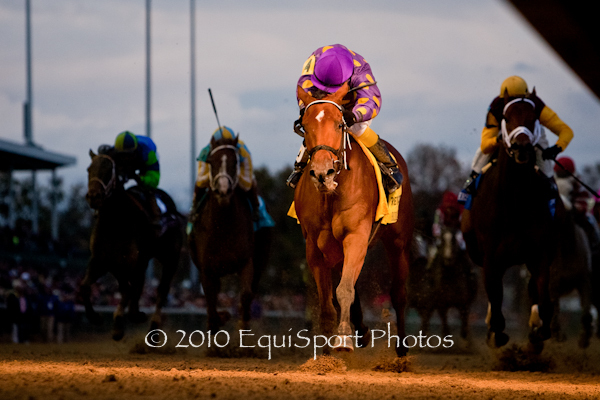 The likely Eclipse Award winning daughter of Awesome of Course improved her record to 6 for 6. Originally campaigned by the breeder, Fred Brei, of Jacks Or Better Farm in Florida, Awesome Feather's selling price "was enough to make me smile. It wasn’t much over the reserve," Brei said. Explaining his reason to go ahead with the planned sale of the filly, Brei said, “We don’t race much out of Florida. And when it comes to going up North, where certainly she belongs in the grade Is that will be coming up when she’s a 3-year-old, it’s just best for the filly and best for us that she’s in somebody else’s hands." Look for Awesome Feather to show up in late February at Gulfstream Park in the early Oaks preps.